Descended in the family of the sitter. Mrs. William McElroy, New York and East Haddam, Connecticut. Sold to (Frederick W. and Jean C. Fuessenich, Torrington, Connecticut); by whom sold in 1951 to Edgar William and Bernice Chrysler Garbisch; gift to NGA, 1956. American Primitive Paintings from the Collection of Edgar William and Bernice Chrysler Garbisch, Part I, National Gallery of Art, 1954, no. 23. Reuben Moulthrop 1763-1814, Connecticut Historical Society, Hartford, 1956-1957, cat. by Ralph Thomas in Connecticut Historical Society Bulletin 21 (October 1956), 98, 105, no. 11. American Primitive Paintings, National Gallery of Art, Washington, D.C., 1955 (temporary replacement for another painting for part of exhibition). American Naive Paintings from the National Gallery of Art, Terra Museum of American Art, Evanston, Illinois, 1981-1982, no. 7 (cat. by Ronald McKnight Melvin). Sawitzky, William, and Susan Sawitzky. "Portraits by Reuben Moulthrop." The New-York Historical Society Quarterly 39 (October 1955): 395, no. 18. Green II, Samuel. "Some Afterthoughts on the Moulthrop Exhibition." Connecticut Historical Society Bulletin 22 (April 1957): 37, 40. American Paintings and Sculpture: An Illustrated Catalogue. 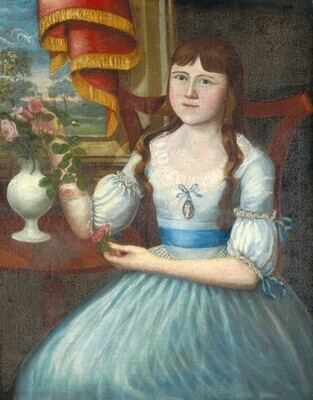 National Gallery of Art, Washington, 1970: 82, repro., as Amelia Martha Daggett by Reuben Moulthrop. American Paintings: An Illustrated Catalogue. National Gallery of Art, Washington, 1980: 199, repro. American Paintings: An Illustrated Catalogue. National Gallery of Art, Washington, 1992: 398, repro. Chotner, Deborah, with contributions by Julie Aronson, Sarah D. Cash, and Laurie Weitzenkorn. American Naive Paintings. The Collections of the National Gallery of Art Systematic Catalogue. Washington, D.C., 1992: 464-466, repro. 465.